Hallelujah Calhoun has found herself back at a church youth camp, after an extended absence from all youth group activities. Although the reader isn’t clear about what happened exactly, we know that it involved the preacher’s son, Luke, and extremely disappointed parents. We know that since, Hallie has quit choir, has lost her friends, and has retreated inside herself. But now she’s back at camp, hiking through the Smokey Mountains, and every moment in the same vicinity as Luke and his cohort is excruciating. There is a new girl at camp, however, named Rachel, who is outgoing and attempts to befriend Hallie. When she and Rachel and Jonah (Hallie’s friend prior to the Luke incident) find themselves separated from the hiking group, Rachel is insistent in hiking back to camp, and Hallie and Jonah agree to go with her. But when they reach a Y in the trail, they choose the wrong path, and soon are completely lost. Day turns to night turns to morning and night again, and days go by without any sign of rescue. Before long, their situation turns dangerous, and they have to rely on each other entirely if they are going to have any hope for survival. I struggled to get into this one. I found myself dreading finding out what actually happened between Hallie and Luke, while I was simultaneously somewhat bored by the tedium of their being lost in the woods. Nothing was particularly wrong with the novel, I just wasn’t immersed. But THEN, for the last 150 pages, I simply could not put it down. The intensity of their situation picks up, we finally hear the full story of “the incident” (don’t worry middle school librarians, it’s early-teen friendly, and even a healthy way for teens to explore early romantic pressures), and we are able to see some hope among their desperation. Hallie’s story is wonderfully relateable, and I will definitely recommend it to my kiddos. Okay, so, confession time… sometimes I buy books because they’re pretty. Perhaps you think this is an irresponsible use of school money, but I say, IF IT’S PRETTY, THEY’LL CHECK IT OUT. I mean, I did. (Plus, of course, it had some great reviews, so low risk). I feel like I’m just rewarding the graphic designers for doing their job well. So, because #IJudgeBooksByTheirCovers, there was a chance this would be a dud. But GUYS, I LOVED THIS. As someone who reads a lot of middle grade fiction, I’m sometimes wildly surprised by beautiful writing. That’s not to say that middle grade fiction doesn’t have good writing, but it has its audience. And that audience is primarily made up of 8-12-year-olds. Not 28 year old former English majors. So when I come across a book whose language and writing is as beautiful as its story, I may become obsessed. I mean, check out that opening line I included at the top. Usually, I just have an opening sentence. But I couldn’t stop at a sentence! I just couldn’t! Mira lives with her mother and younger brother on Haven, a small island just off the Jersey Shore, where the summers are filled with tourists and the off-season is filled with racing around the 3 sq miles of island with her two best friends, Eva and Deni, on their “modes” (of transportation): a golf cart for Deni, a skateboard for Eva, and a pair of old school skates for Mira. Mira’s brother, Jasper Lee, has a crippling congenital illness that requires weekly treatments on the mainland, so on this particular Wednesday, it’s normal that her mother and brother hop in the car and head off of Haven. It’s normal when the clouds roll across the waves, because as the weather forecasters tell them, it’s headed back to sea. It’s normal. But it’s not normal when her mom calls to tell her that Jasper Lee had a terrible reaction to one of the medications and has to stay at the hospital for several days. It’s not normal when she sees a dark shadow of a person walk up her boardwalk to her house and shuffle around for a while before walking away. It’s not normal when the wind and rain pick up and it’s clear the storm did not head back out to sea. After a terrifying night, which Mira almost doesn’t survive, she is forced to head out to check out the damage of the island, and see how she’s going to pick up the pieces. Like I said, the lyrical and poetic writing just swept me along with the story, and made me stay up way past my normal sleepy-girl bedtime. I hope my students will be swept along like me, rather than stuck at what may not be as straightforward as they’re used to. I’ve been falling behind on my blogging lately, guys. I was doing so well! Sheesh. But here’s another one for next year’s SC Junior Book Award list, and since I’m anxiously reading it’s sequel right now, I feel capable of blogging about it, even though it’s been a while. Plus, it’s one of my favorites so far, and before the list, I had never heard of it, which means you may not have either! Set in a sprawling fantasy world with eight major kingdoms (complete with a map in the end papers! 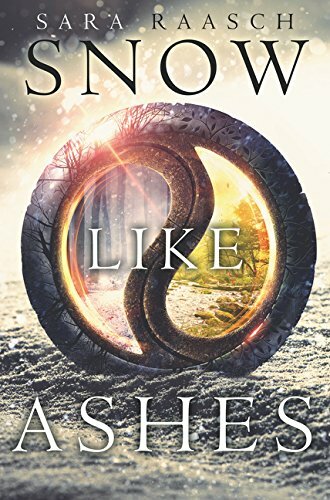 ), Snow Like Ashes gives us our heroine, Meira, one of just eight refugees from the Kingdom of Winter. Meira was an infant when Winter fell to the evil hands of Angra, king of Spring, and all of her fellow Winterians were captured and put into slave labor. Only a handful — including Meira — escaped. Sixteen years later, the refugees are still quietly fighting to recapture the magic emblem of their fallen monarch, Queen Hannah, in hopes that when it is recovered, Winter can be restored, despite the fact that Hannah’s heir Mather (who was also a baby at the fall), does not carry his mother’s female-lined powers. All Meira wants is to help the cause, but she is routinely stopped by Sir, the leader of their pack, forced to remain in the safety of camp while Mather and the others regularly put themselves in danger. When she finally gets a chance, Meira goes way beyond Sir’s expectations — she actually recovers the treasure, Queen Hannah’s locket! Unfortunately, it’s only half the locket, and Meira’s actions send the group on the run again, right into a destiny Meira never expected, one that’s been in the making ever since Winter fell all those years ago. I got totally wrapped up in Meira’s story. Like Katsa in Graceling (one of my faves), she’s independent, fierce, courageous (feeling her fear and acting anyway), and believable. She doesn’t always understand what’s happening around her or to her, but her determination just makes you desperate for her to succeed. And let’s be honest, the very mild love triangle interest has my heart beating just as fast as any tween reader’s. If any one has any tips for me for selling fantasies to middle schoolers, I’m all ears. Because I want this one to be a top contender on next year’s JBA list, and I’m afraid I’m not going to do it justice with getting it in the hands of my readers. Onto the next one, Ice Like Fire, and anxiously awaiting the third, Frost Like Night, expected September 2016. What a delightfully weird book this is. Oh, how I loved it. Someone on Goodreads said it was as if Edgar Allan Poe, Dr. Seuss, and Tim Burton all sat down and wrote a book together, and Paperbackstash was right. Jonathan York got himself lost in the swamp on his way home, and it’s getting dark. Of course, that means it’s getting a little too “Snow White in the creepy woods scene” for him, and he’s only all too happy when he happens upon three strangers who suggest he accompany them to a nearby inn. Luckily for Jonathan, the innkeepers don’t accept money as payment, only stories. Really good stories. Unfortunately for Jonathan, he’s terrified of public speaking and cannot think of a single story. The strangers have some wild stories, indeed. But when it’s Jonathan’s turn, he’s kicked to the curb (or the dark, shadowy swamp) after failing to produce a story. And so begins the most wild story of his life. The artwork, while sometimes SUPER creepy, also has lots of great and hilarious details. You can tell that this creator is just as much an artist as a storyteller. I also love that stories are the form of exchange here. That should be the case more often, right?